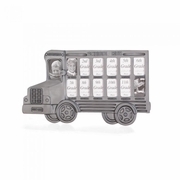 This pewter-finish school bus has enough windows to frame all of your child’s wallet-sized class photos from K–12. A charming way to remember all their school days. 12 1/2" x 1/2" x 7 1/2" high.